Thanks again to Jeanne Schumacher, who I introduced you to recently when she interviewed me on video for Insights on Being a Mindful Vegan with Lani Muelrath. Jeanne continues to catalog an impressive collection of video interviews of thought leaders and world changers in the vegan and plant-based world via her starchqueens project. 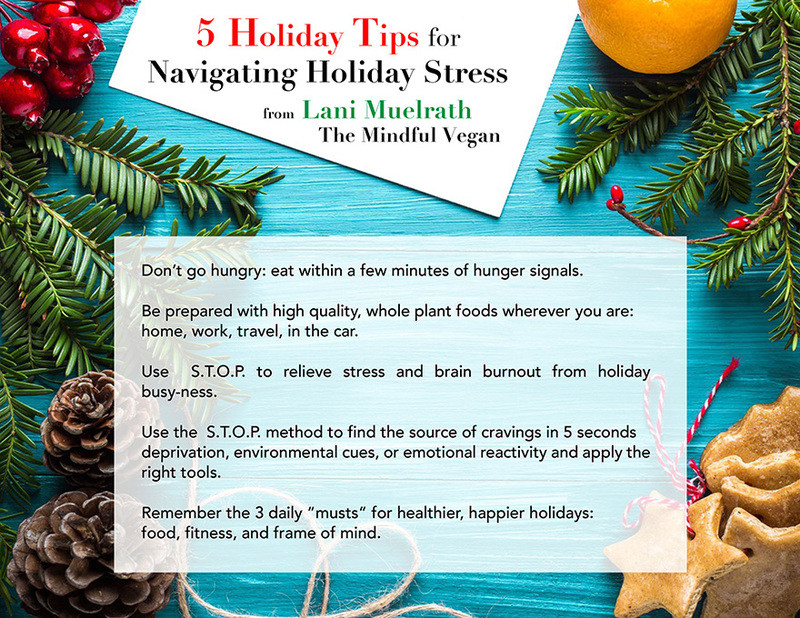 This week on Jeanne’s show, I share my top five tips for navigating the stress and temptations of the holidays. Number five we didn’t make the final video edit (there were some tech difficulties) but they are there just the same! Here is a handy graphic made as a quick reminder. I wish you all the best through the holiday season, and beyond. I can’t say enough about even a few minutes of mindfulness practice each day to help you stay more solidly connected with presence and calm. During busy times, rife with demands on our schedules and emotions, this becomes more critical than ever. Keep The Mindful Vegan close – this book is perfect for simply opening up to any page at any time to grab a quick inspiration and moment of respite. Here’s to a kinder, healthier, happier holiday season for all!